DSC can be used to determine phase transition temperatures and transition enthalpies, even for curing reactions. The sample analysis is generally performed in a crucible with pierced lid under normal pressure and a consistent purge gas flow. DSC has also found use in the analysis of photo-curing reactions. 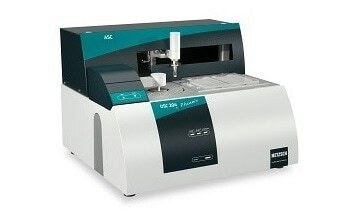 A NETZSCH DSC 204 F1 Phoenix equipped with an ultraviolet lamp, as shown in Figure 1, is a versatile instrument for such analyses. The sample preparation takes place in an open crucible that is irradiated by ultraviolet light. It is possible to vary the intensity and irradiation time at a defined temperature program. A dynamic temperature program or isothermal conditions are generally used. The results of the Photo-DSC for the curing of an acrylate-based screen printing ink are depicted in Figure 2. The analysis involved the investigation of two samples of different lots under a nitrogen atmosphere at a constant temperature of 35 °C. Irradiation occurred in a pulsed fashion with ultraviolet pulses with a pulse time of 1 s and an intensity of 1 W/cm2. The conversion curve is derived from the measurement by assuming that curing does not take place during the last irradiation step. The last irradiation step is subtracted from the earlier steps, while the enthalpy of a single step is set in proportion to the total enthalpy. From the conversion curve depicted in Figure 3, the very narrow difference in the curing behavior of the poor and good samples during the first two irradiation steps is clearly seen. Figure 3. Conversion of a screen printing ink (green: "good lot"; red: "poor lot"
The total enthalpies for the two inks which exhibit significant differences are illustrated in Figure 4. The reactivity of the good sample is higher than that of the poor sample. The impact of oxygen on the curing behavior is familiar for acrylate systems, as shown in Figure 5 for good screen printing ink. It may be easy to acquire UV-DSC measurements with different atmospheres using the NETZSCH DSC 204 F1 Phoenix® and the internal mass flow controllers for an accurate purge gas flow. The results exhibit that the enthalpy for curing is lesser than the measurement taken under a nitrogen atmosphere. The present oxygen serves as an inhibition agent for the UV-curing process. The UV-DSC results for two blue inks are represented as blue curves and those of the red inks are as red curves in Figure 6. Both blue inks (different lots) exhibit a much higher enthalpy for UV curing than the red inks. The UV-DSC results are also monitored the very narrow variations in the curing behavior of the two ink lots of the same color. UV-DSC results are useful tool especially in new formulation development in order to achieve formulations of different colors but with the identical curing behavior which is crucial for the application. It is also possible to use the UV DSC for dual-curing systems such as special types of adhesives, which show a thermal post-curing effect in addition to UV radiation curing. The results for such a system are illustrated in Figure 7. This example clearly shows that the curing behavior can be completely characterized with one single UV-DSC experiment. The combination of DSC and the radiation of an UV lamp enables the analysis of curing processes of UV-curing systems. The results acquired help better understand the curing mechanisms and kinetics of curing reactions. 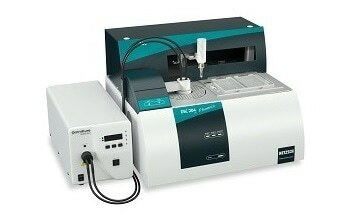 Moreover, dual-curing systems can be analyzed within one single experiment.